Please prepare 32 bars of a Broadway-style song, up-tempo or ballad, that shows vocal range and ability. A piano accompanist will be provided. Please bring your sheet music in the correct key, theatrical resume and headshot. For dance, wear appropriate attire and proper shoes, and be prepared to learn a dance combination and perform it. There may be cold readings from the script. Be prepared to list all conflict dates as that may influence casting. Select your preferred audition time from the available time slots. Plan to arrive sufficiently early to give yourself ample time to sign in and warm up. While we will work hard to stay on schedule, we ask for your patience and flexibility in terms of audition times in the event we ask you or others for additional time or are running a bit behind schedule. Our intent is to ensure everyone has the best opportunity to put their “best foot forward” as we work to cast an AWESOME production. 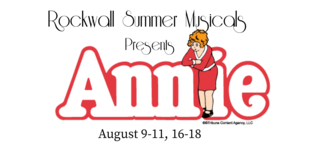 Annie auditions will be held April 27 & 28. Dance call: 4 - 6pm Please wear proper attire/comfortable clothing and comfortable dance shoes, jazz, tap, or regular hard sole shoes. For more information or questions, please contact us at 972.771.3700 or [email protected].